I’ve been working on my second novel for The Half Blood Sorceress series for a while, and pushing through the knots I made in the plot, trying to unravel everything. It was getting to the point I just didn’t want to look at it anymore. So I set it aside for a week and wrote something different. Here we have a graph showing my word count per week since the beginning of this year. This week I set aside my usual work and I wrote a litRPG. I’m currently about half way done with it, and loving it. I love that the words came so easily, even though I didn’t really have a plot at the beginning. But the plot really took a hold, and after talking to Bjorn about it a bit he asked a couple questions and that made the plot so much better. It became a full story instead of just a little snippet of an adventure. So far I have written at least twice as much each day on this new story. Something about it is just fun to write. And that fun keeps me coming back to it, writing more. I think the Half Blood Sorceress became work instead of fun once the plot got so out of hand that I was actually considering rewriting ten chapters instead of just editing it. I’m still considering rewriting, or dropping a few of the chapters, and that doesn’t seem like much fun, so of course I have put it off some more. But don’t worry, I won’t be doing that forever, just for this week. You know that saying “do what you love and you’ll never work a day in your life”? It isn’t entirely true. Bjorn works a lot, and he loves what he does. But even when you love what you do there are some days when it isn’t as fun, and he has to slog through a bit to try and get it complete. He keeps going because eventually the work will be done and he can get back to the fun part. There is something he loves just waiting for him to complete the slog so he can get back to the good part. It’s the same with any skill, really. Learning a language? You have to practice. Learning an instrument? Repatition isn’t fun, but you learn faster that way. Writing? Sometimes you just have to push through and get it done. Throw away, cut, rewrite, and continue. And sometimes you need to set it aside for a bit and have some fun. Knowing when to do that is the trick. Knowing what the best course of action, and what you can finish, makes a huge difference. Every morning I get up, I take a shower, brush my teeth, and go to work. I put on a pot of coffee to slowly sip and wake up. I greet my customers with a smile on my face, even when inside I want to run away. Go home. Slip into bed with a book and a bottle of orange juice, and forget the outside world even exists. I don’t want to be there, but I go. I have to pay my bills, and take care of my children. This isn’t a choice, it’s a necessity. And I go, even though I don’t wanna! 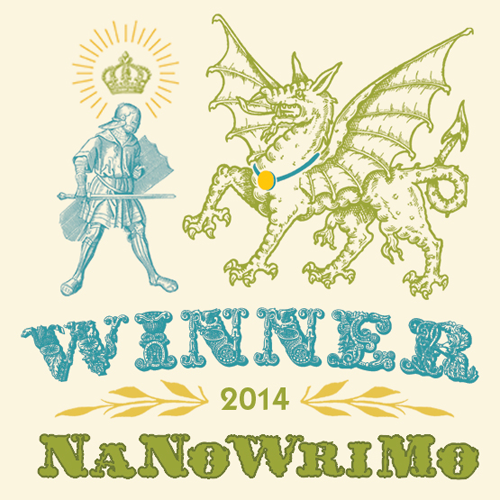 This month I’m participating in NaNoWriMo. And this week… I don’t wanna. I don’t want to write. I don’t want to sit in front of the computer. I don’t want to fill in paragraph after paragraph of someone else’s life. There are those who say you should only write when you are inspired, and I heartily disagree. Inspiration is not what gave me thirteen books, and over 100 thousand words in stories published on Amazon. Inspiration started the story, but sheer determination finished it. I don’t want to sit in front of my computer typing. Not today. Today I want to cuddle up and play a game, or watch TV. But TV and games won’t put words on the page. And they won’t further my goal of being an author that makes my living from my writing. So I’m going to go write. I might have to rewrite it. But I’m still going to go do it. I tweeted this morning that I’d written 12,000 words this month. That’s 500 a day, on average. Some days I did more, some days I did none, but over the average it’s 500 words. The one thing that keeps me writing (almost) every day is my spread sheet. The trouble with a “zero” day isn’t that I got a zero, it’s that the next day I don’t write as much. And if I have two “zero’s” in a row I have to struggle all that much more to get some words out. I actually started this about February. That’s when I realized I was struggling, and I needed more accountability to myself. Something I had in spades during NaNoWriMo, but lacked afterward. 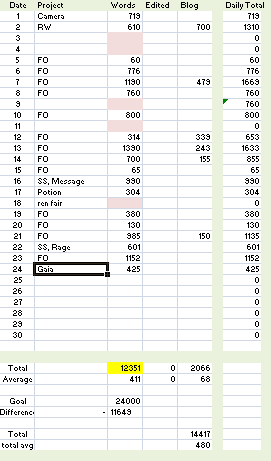 I no longer had that nifty little graph showing my progress, or the bar creeping forward saying weather or not I “won”. So, I decided to make my own graph. It took a few tries to figure out exactly what I should have on my graph. As you can see there is an “edited” column that rarely gets anything put into it. I’ve edited quite a bit this month because I am rewriting sections of “Rage War” in between writing “Forgotten Ones” and finishing up a short story. But I never really think about the edited pages, I just want to track what I’ve written. I’ve also forgotten to add my word counts for a couple of days. Every time that happens I am extremely disappointed n myself. This has become an incredibly important part of my writing. It’s tracking my growth and accomplishments as I move forward. Soon after figuring out my own graph I discovered “The Magic Spreadsheet” from Mur Lafferty. I really like her version, and how it gives you points for each day you reach your goal, but I’ll stick with mine for now. However, maybe some of you would like to try it out. Whatever method you use, the best advice I can offer is just to try new things. Find out what works for you. I know authors who keep a writing journal in paper, and jot down a note every day. I know others who blast it out on twitter, o reddit. Still others keep writing journals on a blog. But I do know that it won’t hurt for you to try to keep track and figure out what you are really doing. I would love to add time of day to this… but my scheduled doesn’t allow that right now. It’s too chaotic. Chalk that up to a dream for the future.